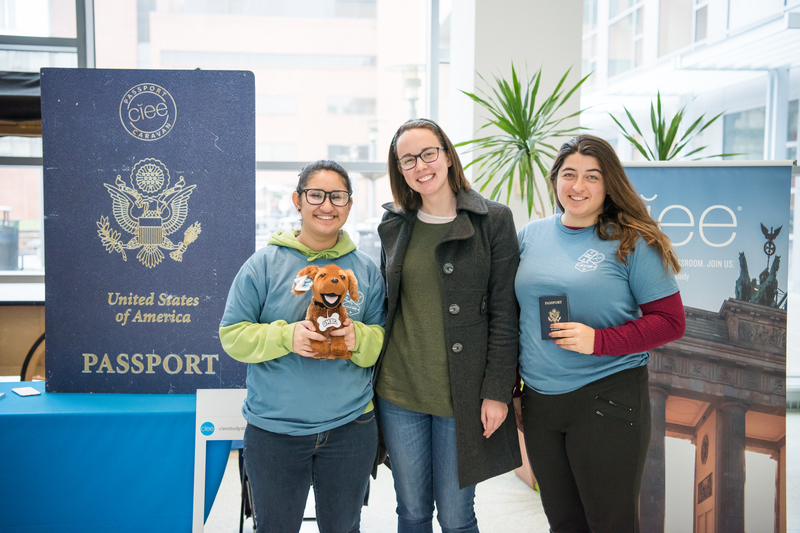 The UMBC Office of International Education Services (IES) hosted its first Passport Caravan this spring to jump-start students’ study abroad journeys. In partnership with UMBC’s study abroad affiliate, the Council on International Educational Exchange (CIEE), and the Baltimore County Public Library, the event, organized by Caylie Zidwick ’08, modern languages, linguistics and intercultural communication, IES assistant director, increased access to study abroad programs by fully funding 40 students’ new passport applications and providing information to students across all majors on how international education can enhance academic and professional opportunities. The study abroad team (l-r): Caylie Zidwick, assistant director international education services; David Anguish ’12, political science and modern languages, linguistics, and intercultural communication and M.P.P. ’18, public management, international student advisor; Brian Souders, David Di Maria, and Rachel McCloud ’16, Asian studies, study abroad advisor. Study abroad can involve a complex set of logistics and, while there are certainly support resources available, starting the process can be challenging for students who are juggling many responsibilities. “Getting a passport is often the first step in changing a student’s mindset about international education, to see it as a realistic option for them,” says Brian Souders, Ph.D. ’09, language literacy, and culture, IES associate director. 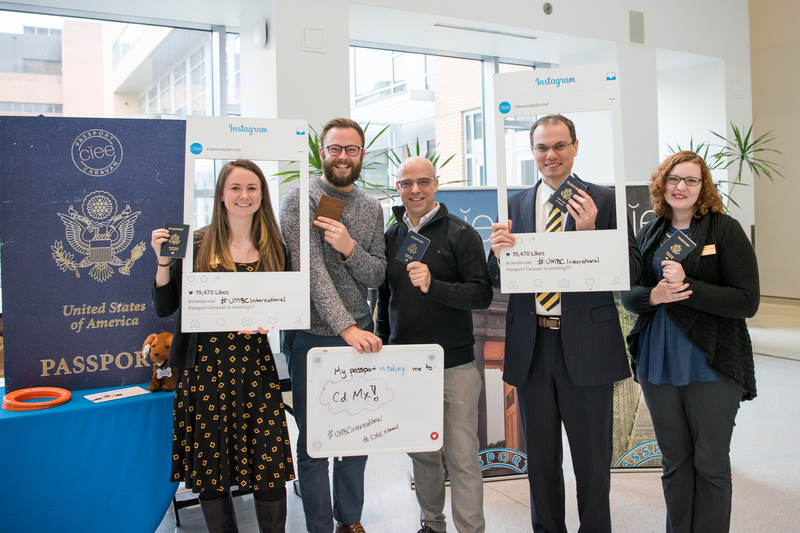 The program also highlighted how simply being prepared to travel internationally—by developing cross-cultural communication or foreign language skills, or securing that first passport—can make a new graduate more competitive in the job market. Study Abroad 101 student leaders (l-r): Sara Masoudi, Marijka Frazier, and Megan Savastuk. Beyond the Passport Caravan, UMBC study abroad student leaders also work to share the message that credit-bearing international experiences can open doors for future careers through weekly Study Abroad 101 information sessions. Marijka Frazier ‘19, social work, studied Spanish in Madrid, while living with a host family to strengthen her language skills. “I plan to go back as an English assistant in schools to further my knowledge of Spanish for a couple of years before continuing to a master’s in social work to become a bilingual play therapist,” she shares. Megan Savastuk ‘18, emergency health services and global studies, studied Spanish in Costa Rica and will teach English in Japan next fall while studying building code design for national disasters. Sara Masoudi ‘18, computer science, who is also a Center for Women in Technology (CWIT) Scholar, studied computer science in Sweden, and says being part of CWIT and having an international study experience helped her secure a position on Disney’s ESPN web team for after she graduates this spring. 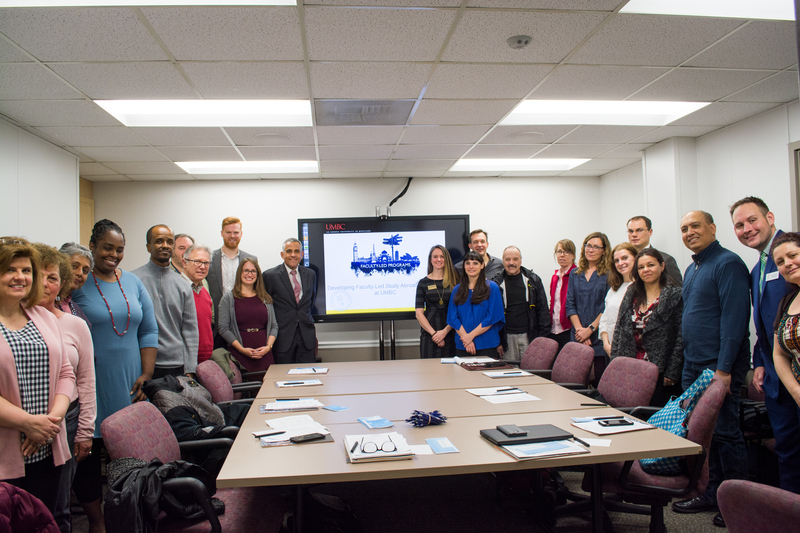 Faculty from CNMS, COEIT, and CAHSS participated in a workshop to learn more about faculty-led international educational experiences. Zidwick is also working to increase awareness of credit-bearing international educational opportunities among faculty, recently hosting a packed workshop on faculty-led educational experiences abroad with CEA, another study abroad partner. Caroline Forestiere, associate professor and chair of political science, shared her successful experiences leading groups of students to Italy, focused on learning Italian language and politics. Faculty also heard about the work of colleagues like Chuck Eggleton, professor and chair of mechanical engineering, who is exploring bringing students to Colombia after winning a Fulbright award in the country last year, and Preminda Jacob, associate professor of visual arts, who is examining opportunities for arts-focused student experiences in India. Christine Mallinson, professor of language, literacy, and culture, is already planning to lead a new credit-bearing educational experience in Amsterdam, English as A Global Language, this summer. The program is designed for students interested in studying the roots, development, and globalization of the English language and its many variations. Students interested in faculty-led international learning experiences for the summer of 2019 should apply by next February. The deadline for individual study abroad opportunities for the summer and fall of 2018 is Saturday, March 10. IES requests that students attend a Study Abroad 101 session before initiating the application process. Sessions are held on Mondays, 12 – 1 p.m., and Thursdays, 3 – 4 p.m., each week during the fall and spring semesters in Administration Building room 218.